Some iPhone 5 users are experiencing a variety of issues with wifi on the device, almost always revolving around inconsistently slow wireless connections. If you’re having this problem, you’re not alone, and the good news is you can almost certainly get an immediate improvement by setting manual DNS on the device. Leave Settings and try running Speed Test again, browse the web, or doing anything online with the iPhone 5 using the same wi-fi connection. Everything should be leaps and bounds faster. Interestingly enough, we’ve been here before, and using custom DNS entries directly on the iPhone has fixed slow wi-fi issues in the past. With the same solution working again, it suggests it’s a compatibility issue with how the iPhone is interacting with certain routers. This would explain why not everyone experiences the problem, and why the same iPhone has issues on some networks but not others. For iPhone 5 owners that have not experienced the wi-fi issue, basically it’s a lot slower with intermittent connectivity. Give it a try, let us know how it works for you. Giving this a try… so far so good let’s hope it holds up. Another thing that made a difference for me yesterday was changing my routers channel to one with less interference. Could be important for some. Once a TCP connection is established to a server, the nameservice functions are not accessed again. What this suggests is that there’s some issue with the DHCP-supplied nameserver address(es), and that the speedtest site is testing more than just throughput, but the time it takes for a new tcp session to be established to another server name, and data to begin flowing. So if you have a wireless router, ensure that the DNS servers supplied by it are correct, before manually setting up DNS server IP numbers in your mobile device. Yeah this is a really weird solution. I believe this test is seriously flawed. As another reader pointed out, once the TCP connection is established DNS is out of the equation. 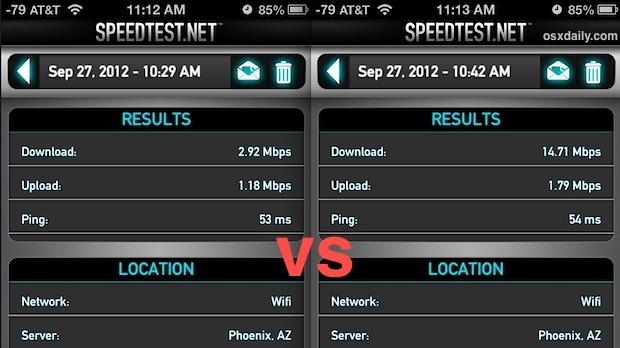 Plus, testing both iPhones at the same time makes them ‘fight’ for bandwidth. They’re both sharing the broadband connection. No wonder that the addition of the bandwidths reported by both iPhones (9.77 + 5.64 = 15.41) is extremely close to the bandwidth reported by the single iPhone (14.71). Very true about bandwidth fighting, but I can report the same issue. iPhone 5 using auto settings is just slow on my network. iPhone 4S (running 5.1.1) works fine. iPhone 5 with manual DHCP runs at same speed as iPhone 4S as auto. I bet this is router and software dependent. This is working for me so far by using manual DHCP settings completely with manual DNS. I think this is obviously a router specific problem though, so it’s no wonder it won’t work for everyone. I set OpenDNS and I can say the web is definitely quicker. That video makes no sense because of reasons @Zigor points out though, bad example really. I reset my network settings and manually reconnected to my network. This fixed the problem for me. Supi, did work for me. Had full connection to my Fritzbox Router, showing 65Mbit connection speed. But download was much slower. For example Skobbler maps about 50kbit. Changing DNS brought it up to 5Mbit. This solution really increased the speed. My wifi connection is now blazing fast. We will see if it helps maintain connectivity. My problems was getting dropped from wifi and slow speed. So, the wifi is much better at home, but we shall see once I get to work. ran this check – my current DNS was #2 – switched over iPhone 4s, first gen iPad (which was slow as molasses) and new iPad 3 (which was faster, but still disappointingly slow) – all speeds improved, especially iPad 3! OMG this worked perfectly. Thanks so much! This dramatically increased my Wi-Fi speeds at home on 1x iPhone 4, 2x 4s and on iPad 2 and 3, I am using Airport Extreme with latest firmware. All computers are fast, but all my iDevices crawled to a halt after upgrading to IOS6. There must be something going on here. My iPhone 4S with iOS 5.1.1, and later iOS 6 did quite well on the WiFi (Time Warner Cable, Cisco 2000 router), typically 25 msec Ping, 15 to 18 MBps download 1.6 to 1.8 MBps upload. My iPhone 5 does about the same… though sometimes drops to 13.5 MBps download. Oh, I’m using Open DNS set at the router. Since I like Open DNS’ protection features, I am not setting any other DNS servers to maybe gain a tiny bit of speed. 13 to 18 MBps is more than adquate for streaming HD video; what’s the difference? I guess this setup isn’t one that’s affected by the reported bug. Has anyone tried this in attwifi at mcdonalds or starbucks (or any public wifi connection)? I have both iphone4 and iphone5 with me. No problem connecting to attwifi or public wifi on coffee shops using my iphone4 but iphone5 is a different story. Already tried multiple locations and all did not work on iphone5. Big difference switching to static address with manual settings. But still not convinced iOS 6 is as fast as 5.1.1 even with manual settings. I have a webcam on my home network. Viewing with my iPad at 5.1.1 I get pretty smooth motion JPEG but iPhone 5 gives me a jerky 1 fps. There’s definitely something wrong with iOS 6.0 networking. Thanks – this worked like a charm! Not so much for me. still pulling only 2-3mbs, while my laptop pulls 10mbs off the same router. Well i have the iPhone 5 32 gb and im having some serious wifi issues on my home network! Funny thing is my wifes iphone 5 16 gb is in my other hand working like a charm on wi-fi! Very frustrating! Any suggestions on this one??? This worked. I couldn’t stream video before. Even middle quality youtube videos failed to load on my 20mbps connection. However, on my iPhone 4 with same connection I had no problems. Apple’s only suggestion to me was to drive 2 hours to an apple store. Seems to have worked on my home router (Netgear). I was having issues with all youtube videos, most wouldn’t start others would stop after a short bit. My solution before was switch to LTE was luckily is fast at my house. I might try this at work but since my office has a 10Mbps connection and LTE at my office is generally high 20s I’ll probably just stick with LTE. PHONE WILL CUT OFF, REBOOT AND TOGGLE YOUR WIFI OFF FOR ABOUT 10 SECONDS, TURN BACK ON AND YOU WILL BE GOOD TO GO..
LOL the suggestion from LancasterTheWiz worked for me. When my IPhone 5 arrived it would not connect to my wifi no matter what so I did the manual thing as a work around. Just now reset my network settings and after the phone rebooted was able to auto connect to my wifi without issue. Suggest everyone gives that a try just to see. Web performance and Speedtest have always appeared to run ok on my iPhone5. My problem is the app store performance is TERRIBLE on wifi. If I’m connected via LTE app/downloads blaze through quickly. The moment I turn on wifi, they slow to a crawl. Has been that way since I got the phone and it’s repeatable on a number of different wifi networks. The above fix did not work for me. Find it funny that the only networks my iphone5 seems to have trouble with are ones running off an Apple Airport router…. My iPad 2 wifi connection has been terrible since 6.0 and 6.0.1 upgrade. Low signal strength, dropped connection. I changed the internal DNS address to open dns (208.67.222.222 or 208.67.220.220) and used admin settings to change my home router wireless mode to only accept 802.11g. It fixed everything, signal strength improved from 1 or nothing to maximum, Netflix works properly again, games stopped dropping connections, web pages load much much faster. Lancasterthewiz – Your easy fix worked PERFECTLY. I even received two “lost” texts from this week.